Investment data shows that real estate activity has held up well, suggesting that China has support from a key sector even as the trade war escalates. Could this delay further trade talks until after the midterm elections even if the US lowers the tariff rate to 10% from 25% on the $200 billion goods? 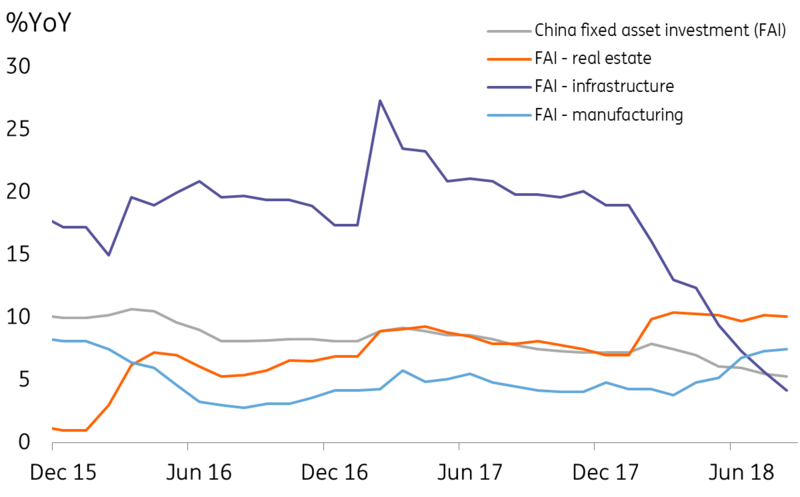 Real estate activity in China has continued to support overall investment, suggesting that sentiment in the real estate asset market is still positive, even amidst the trade war. This could buy China some time and suggests there's no rush for them to enter trade talks again, as reported in Chinese media. With tariffs on $200 billion of goods yet to be imposed, the offer of talks from the US - led by Treasury Secretary Steven Mnuchin - could signal that the administration is interested in some sort of compromise, possibly lowering the tariff rate to 10% from 25%. Though it is reported that President Trump also wants to impose further tariffs on $267bn of goods. China could delay talks until after the US mid-term elections, as discussions before then are unlikely to yield any solid result. President Trump's tweets also suggest he is in no hurry to strike a deal with China. Investment was slower than expected in August because we misjudged the timing of fiscal stimulus. We did not expect railway investment to deteriorate from the previous month's -8.7% year-on-year YTD rate. Instead, it was down 10.6% YoY YTD. Still, we believe that transportation infrastructure will rise in the coming months to reflect the results of fiscal stimulus. We still expect to see fiscal stimulus come into effect in September. If not, we may need to gauge the situation in China again. It could be that the government is looking ahead and wants to avoid too much overcapacity in the future, even if the economy is currently facing the negative impact of a trade war. It could also be that the government has estimated a smaller impact from the trade war compared to our own estimates. In this case, China may not need a lot of pro-growth programmes.